EPF (Employee Provident Fund) is one of the best retirement plans offered to salaried employees. The deduction happens automatically, the employer makes an equivalent contribution and above all the interest earned is tax free. If the EPF amount is never dipped into and is transferred every time job change happens it would result in substantial retirement fund. But many employees willingly or by compulsion want to withdraw the EPF balance once they change job or have a longer break between jobs. However there is some confusion on taxation and TDS of EPF. In this post we would try to clear out the confusion. EPF can be taxable or tax free depending on the duration of your job. EPF is tax free if it is withdrawn after 5 years of continuous service. Here continuous service can be across multiple organizations but you should have transferred the EPF balance from previous organization to the current one. In case you withdrew and did not transfer the earlier balance to current organization, it would not be considered service of 5 years. While filing income tax returns you need to put this income in exempt income. For e.g. You have worked with your most recent employer “A” for 15 months, before that you worked with another employer “B” for 24 months and before that with employer “C” for 36 months. In case you had transferred your EPF from C to B while moving and then from B to A, then you satisfy the criteria of 5 Years (15 + 24 + 36 = 75 months). However if you withdrew your EPF while changing job, this would not be considered continuous service. In case the EPF is withdrawn before 5 years of continuous service (except as in the above cases), the amount becomes fully taxable as per income tax rate applicable to you. Also Read: Voluntary Provident Fund – A Good Tax Saving Retirement Option! There is NO tax in case EPF is transferred from one organization to other while changing of job. 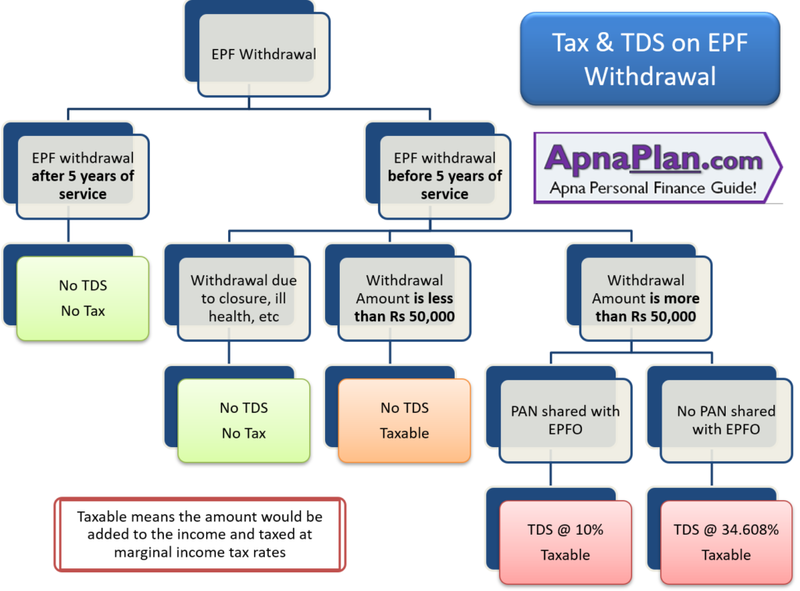 In case the EPF withdrawal is not taxable (as explained above), no TDS has to be deducted. If EPF is taxable but the amount is less than Rs 50,000 (changed from Rs 30,000 from June 1, 2016 on wards) NO TDS is deducted. If EPF is taxable and amount is more than Rs 50,000 TDS at the rate of 10% is deducted in case PAN is submitted. In case PAN info is not provided TDS is done at the rate of 34.608%. The TDS deducted would reflect in your Form 26AS and you can adjust the same when filing tax return next year. In case your estimated annual income while withdrawing EPF is less than Rs 2.5 lakhs, you are eligible to submit Form 15G/H to avoid TDS. There is no TDS or Tax when you transfer EPF from one employer to other while changing your job. You cannot close your EPF account when employed. You can withdraw EPF completely only if you have been unemployed for 2 months or more. While employed you can make partial withdrawals or take loan against EPF balance for certain things like buying house or illness or marriage. Put GPF withdrawal in exempt income if it was tax free.